It’s not every day that you sit down with a glass of wine and discuss a book with the actual author; not surprisingly, it was a first for our book club. This month we chose to read a very personal, heartfelt memoir written by Susannah McFarlane, called Heartlines – The Year I Met My Other Mother. We had such a memorable night with Susannah, and we relished the opportunity to discuss the book, and to hear how her journey has continued since Heartlines was published. Happily, our favourite rooftop bar, Siglo, received a significant mention in her book, making it an easy choice for our discussion venue this month. In 1965, Susannah was born to Robin and Tim. Young, carefree, and about to embark on a hitchhiking adventure, they gave up Susannah for adoption. After 10 traumatic days alone in the hospital, a loving family adopted the newborn baby, and in time, she bonded with her devoted parents and siblings. The adoption laws in 1965 made it clear that there could never be any contact between birth mothers and their children; however, in 1984 that changed, paving the way for parents and children to reconnect. Heartlines is the compelling story of their reconnection, 50 years later. If the name Susannah McFarlane rings a bell, it’s probably because she’s a bestselling children’s author, famous for her action-packed adventure stories that draw children into the magical world of books. Many of our sub-urban readers will be familiar with the EJ12 Girl Hero series, about strong, independent girls who are spy agents – cracking codes and solving mysteries with hardly a boy in sight. My own daughter devoured these novels at a great pace, and was even invited to a friend’s ‘EJ12 Spy Party’. So when Susannah embarked on a journey to reconnect with her birth mother, her natural tendency was to write about it – she’s an author, after all. The end product is her honest, warm and very readable book Heartlines, which includes emails and diaries that record her most intimate feelings and experiences. What's more, Heartlines is actually co-authored by Susannah and her birth mother, Robin Leuba. The story alternates between the two voices, adding depth and perspective, and providing an insight into the way the two women often interpret the same interaction, or piece of communication, differently. As I was reading, it almost felt like two dancers who were trying to move in sync. In parts, they’re beautifully aligned, but then the rhythm changes and the dancers stumble, out of step with one another – feeling frustrated, confused, misunderstood. Until they reconnect again. And as Susannah confided, this ‘dance’ is still continuing. 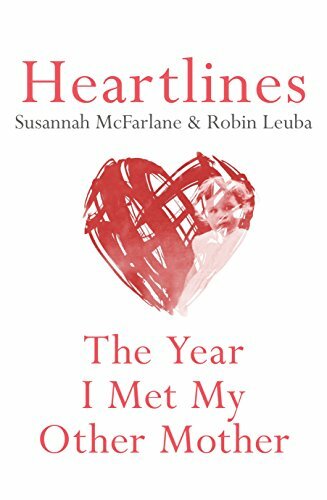 In writing Heartlines, both Susannah and Robin have revealed so much of their inner selves – the book is so raw and candid, and it’s clear that a lot of pain has been subconsciously supressed over the years, including an earlier, one-sided attempt by Robin to reach out to her daughter. As we chatted, Susannah revealed that her desire to reconnect with her mother eventually occurred after she’d finished reading one of her favourite books, On Chesil Beach, by acclaimed English novelist Ian McEwan. I haven’t read this book myself (it’s now on my list), but I was curious after meeting Susannah, so I scanned the online reviews and found this one: “At the heart of this book lies a typical McEwan theme: how the destiny of an entire life can depend on just one instant, one wrong word, one misunderstanding, one failure to communicate properly”. And when you read Heartlines, it appears the reverse is also true: one right word, or one significant piece of well-timed communication, can change the course of your destiny, too. As you’d expect of an author, Susannah is an avid reader herself, and I especially loved our discussion about our all-time favourite books. Interestingly, she nominated King Lear as one of her Top 5 – I’m also a huge fan of this Shakespearean tragedy, but I’d never thought to include it in my list of top reads. Perhaps I should re-do my list. Anyway, when I mulled over this a bit more, it seemed fitting that a play with themes of parent-child relationships, betrayal and reconciliation would resonate with Susannah. Fortunately her book has a much happier ending. However, when Susannah and Robin first began corresponding with one another, their caseworker Maddy cautioned that very few adoption reconnections end well; in fact, most don't go further than an occasional Christmas card. But theirs is one of the true success stories. And if their book helps at least one more family in a similar situation, then Robin and Susannah will consider it a job well done.